The Greater Philadelphia Film Office is keeping track of movies and television shows that were meant to shoot here, and didn’t. World War Z, The Bourne Legacy, House of Cards and American Hustle are on their list. The office contends that Pennsylvania lost these projects because there weren’t enough tax credits to entice them. Concerns that the state’s film tax credit program could be eliminated entirely in Pennsylvania’s upcoming budget talks, spurred Sharon Pinkenson and her team at The GPFO to organized a Rally, held last Saturday, June 3rd, to stir up awareness and support for the program and to highlight all that could be lost if we can't get Harrisburg to Un-cap the PA Tax Credit. 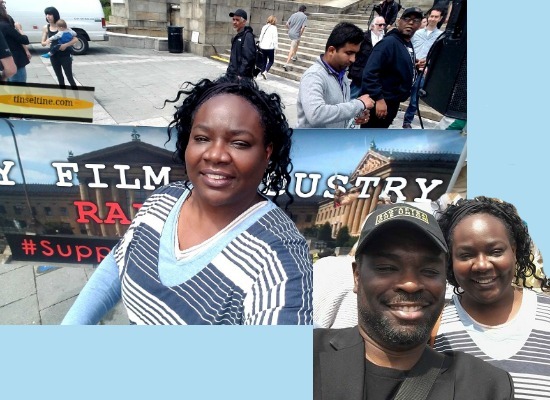 I attended front and center as Tinsel & Tine definitely feels much love and support for the Philly Film Industry. (3) The Next Steps to take to ensure the Pennsylvania Film Tax Credit incentive program continues and expands. Remember, Film & TV production in our city creates jobs, benefits local businesses and shines a spotlight on Philadelphia! Note: photos and video will not be visible to those receiving Tinsel & Tine via RSS feed. GPFO: "In our combined pursuit for the continuation and expansion of the PA Film Tax Credit program. Please connect with Governor Tom Wolf at http://www.governor.pa.gov/contact/ and the elected officials for your district by emailing or calling to tell them just how important expansion of the Pennsylvania Film Tax Credit incentive program is." Not sure of the officials for your district? No problem, you can easily find this information with your address here: http://www.legis.state.pa.us/cfdocs/legis/home/findyourlegislator/#address. I am writing as a concerned tax-paying citizen of Pennsylvania who is working in the film industry. I encourage your support of all bills or proposals that would either increase the film tax credit annual cap or uncap the film tax credits altogether. Please keep in mind, supporting the film tax credit program supports Pennsylvania families and businesses. According to DCED’s latest Report to the Legislature (2014), since the program’s inception, nearly $433.5 million in film production tax credits have been approved/awarded to film production companies under the program. These companies, in turn, have directly injected close to $1.8 billion into PA’s economy; generated an estimated $3.2 billion in total economic activity; and supported an estimated 21,700 jobs (based on 2014 IMPLAN multipliers.) Films bring an unparalleled increase of tourism to an area once seen on the big screen - movies like Rocky, Creed, Philadelphia, and Silver Linings Playbook for examples.